The important task of getting the word out about KVIS in the most effective and appealing way is the focus of the Publications and Marketing Committee. The committee works on developing, maintaining and distributing KVIS publications, including informational and appealing flyers, brochures, posters, the KVIS Common Goal Newspaper, press releases, the KVIS website and varied social media sites. Publications and Marketing Committee meets on the 2nd Monday of every month at 7 pm and at other times as needed. Making sure that local media sources know about the work of the KVIS is a very important job. The KVIS is very fortunate to have a veteran newsperson, Jill Keppeler as our PR Coordinator. 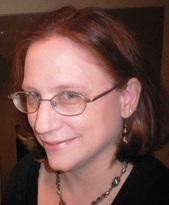 Jill is a lifelong resident of Western New York and a resident of the Town of Tonawanda. During her 17-year-plus career in local newspaper journalism, she wrote many stories about the Ken-Ton area, its history and its residents. Jill and her family can often be seen at KVIS events, especially the Kenmore Children's Concert Series, where the boys never, EVER stop dancing. Mike Ham is the owner of a successful Kenmore business, Kenwood Photography. It’s easy to spot Mike when he’s out shooting photos of wedding parties, KVIS events, or in his studio making terrific Portraits for people (and pets) of all ages. Mike stands about 6’5” and rarely needs to use a ladder to gain height perspective for his shots. As the Principal Photographer of the KVIS, Mikes photos can be found throughout this website, on our printed literature, and on our social media sites. Mike has donated many, many hours to documenting KVIS through the art of his photography. His keen eye, understanding of varied subjects, and love and knowledge of photography are evident in his work for the KVIS. Give Mike a call (716) 871-1190 or stop in to see some of his work at his studio located at 79 Delaware Road in the Village or online at www.kenwoodphotography.com. Ivan Ereiz is a Kenmore resident who has given thousands of hours of community service here through KVIS. Ivan is the Principal Graphic Designer of the KVIS. 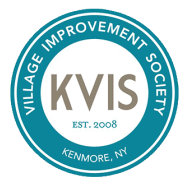 Logo’s like the Children’s Concert Series, Kenmore in Bloom, and Dog Days of Kenmore are all Ivan’s creations for the KVIS. Ivan’s talent, skill, and creativity are evident; a Canisius College Digital Media Arts graduate, Ivan professionally designs branding and identities, collateral materials, ads, billboards, websites, and other marketing tools for businesses, individuals, and institutions. Ivan is a gifted and giving person with a quick mind, compassionate viewpoint, fond regard for Kenmore, and creative energy are truly remarkable. For more information about Ivan please visit http://e8-creative.com. Originally from Rochester, NY, Holly moved to Buffalo in 2013 and has been a resident of Kenmore since 2016. She received her bachelor's degree in Communications and a master's in Strategic Marketing. She currently works as the Assistant Director of Communications in UB's School of Engineering and Applied Sciences where she helps with everything from graphic design and web UX to event photography and social media. Holly is a huge dog lover and can often be seen walking her Siberian husky, Hagrid (named after the half-giant from Harry Potter) around Kenmore. My name is Alan Baker. I'm a college student attending Buffalo State pursuing a bachelors degree in Computer Information Systems. I'm expected to graduate in spring of 2019. I was born and raised in Rochester N.Y. and recently moved to Buffalo for school. I have worked in various restaurants in the area. I'm currently employed at Cantina Loco on Allen street. Some of my hobbies include building crypto-currency mining computers, PC gaming, and working on my vegan recipe website Tryitvegan.com. Philip Yeoh was a Kenmore resident who was a professional photographer and graphic designer of the highest caliber who contributed much to the KVIS. The owner of Mad Panda Studio, Phil gave many hours of service to the Kenmore community through the KVIS. From fixing complex computer files to prepare them for printing to making a banner stand for use at KVIS meetings, Phil made himself available to help; he used his time, resources, and considerable talents and skills to help promote the work of the Society whenever he was asked. Phil was the kind of person everyone wishes for in a neighbor, a relative, or a friend -he was reliable, trustworthy and straight forward, kind and generous. A loving father and husband, Phil valued family and community and actively showed this in the way he lived his life; he was a noble and respected person who showed a true sense of gentility in all situations. Though he died when he was still rather young and is missed greatly, it seems as if Phil is with us -he is a shining and inspirational example of a life well lived.